“The piano ain’t got no wrong notes!” So ranted Thelonious Sphere Monk, who proved his point every time he sat down at the keyboard. His angular melodies and dissonant harmonies shook the jazz world to its foundations, ushering in the birth of “bebop” and establishing Monk as one of America’s greatest composers. Yet throughout much of his life, his musical contribution took a backseat to tales of his reputed behavior. Writers tended to obsess over Monk’s hats or his proclivity to dance on stage. To his fans, he was the ultimate hipster; to his detractors he was temperamental, eccentric, taciturn, or child-like. But, these labels tell us little about the man or his music. In the first book on Thelonious Monk based on exclusive access to the Monk family papers and private recordings, as well as a decade of prodigious research, prize-winning historian Robin D. G. Kelley brings to light a startlingly different Thelonious Monk–witty, intelligent, generous, family-oriented, politically engaged, brutally honest, and a devoted father and husband. Indeed, Thelonious Monk is essentially a love story. It is a story of familial love, beginning with Monk’s enslaved descendants from whom Thelonious inherited an appreciation for community, freedom, and black traditions of sacred and secular song. It is about a doting mother who scrubbed floors to pay for piano lessons and encouraged her son to follow his dream. It is the story of romance, from Monk’s initial heartbreaks to his life-long commitment to his muse, the extraordinary Nellie Monk. And it is about his unique friendship with the Baroness Nica de Koenigswarter, a scion of the famous Rothschild family whose relationship with Monk and other jazz musicians has long been the subject of speculation and rumor. Nellie, Nica, and various friends and family sustained Monk during the long periods of joblessness, bipolar episodes, incarceration, health crises, and other tragic and difficult moments. Above all, Thelonious Monk is the gripping saga of an artist’s struggle to “make it” without compromising his musical vision. It is a story that, like its subject, reflects the tidal ebbs and flows of American history in the twentieth century. Elegantly written and rich with humor and pathos, Thelonious Monk is the definitive work on modern jazz’s most original composer. Robin D.G. Kelley. . . comes closer than anyone ever has in attempting to find out exactly who Monk was. 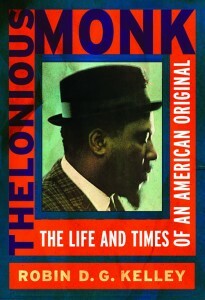 Thelonious Monk: The Life and Times of an American Original is a massive and impressive undertaking. . . . Thoroughly researched, meticulously footnoted, and beautifully crafted, “Thelonious Monk’’ presents the most complete, most revealing portrait ever assembled of the man known as the high priest of bebop. Robin D. G. Kelley, in his extraordinary and heroically detailed new biography, “Thelonious Monk,” makes a large point time and time again that Monk was no primitive, as so many have characterized him. . . . . I doubt there will be a biography anytime soon that is as textured, thorough and knowing as Kelley’s. The “genius of modern music” has gotten the passionate, and compassionate, advocate he deserves. This first full-dress biography of Thelonious Sphere Monk, legendary jazz pianist, prolific and vastly influential composer, and one of the creators, in the 1940s (along with Charlie Parker and Dizzy Gillespie), of the revolutionary new music called bebop, is nothing short of a landmark in jazz literature. . . . Kelley brings Monk alive for those who have heard and loved his music for generations. “Jazz is my adventure,” Monk said. “I’m after new chords . . . how to use notes differently.” Kelley gives us that adventure in the epic scope it deserves. A wealth of historical context is richly studded with details of Monk’s family background and the broader world in which he lived and worked. . . . Kelley presents the clearest biographical picture yet of a man who was certainly a genius and may have been eccentric, but who was also both more complex and more a product of his times than those descriptors indicate. Kelley’s understanding of Monk is multilayered, markedly different from the cracked-brain genius he was often marketed as. His sometimes erratic behavior is attributed to undiagnosed bipolar disorder, while his long relationship with wealthy baroness and benefactor Pannonica de Koenigswarter is once and for all revealed to be platonic. If every icon deserves at least one definitive bio, it’s official: Monk now has his. This exhaustively researched work will undoubtedly now remain the definitive work on Monk, a rebel with a cause. Listen to virtually any of the recordings he left, and it should become beautifully clear what that cause was: timeless music. Miles Davis made more money. Duke Ellington was more prolific. Charlie Parker was more revered. But no one had a more profound impact on modern jazz than Thelonious Monk. The legendary pianist/composer with the strange hats and even stranger moniker (his given name) has finally become the subject of the kind of meticulously researched biography that lesser lights were afforded long ago. The enigmatic Monk is a tough nut to crack, to be sure, but what fascinating and delicious rewards await inside Thelonious Monk: The Life and Times of an American Original, Robin D.G. Kelley’s illuminating biography. . . . This affectionate biography fills in the fascinating and heart-wrenching backstory of an artist the world has always longed to know better.